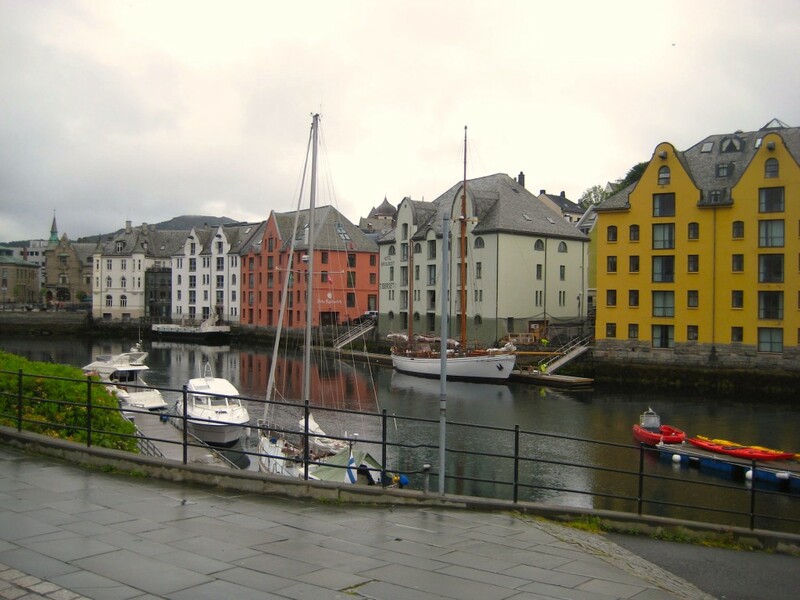 Alesund was once a flourishing fishing harbor but now has evolved into more of an offshore oil industry town. In January of 1904 a terrible fire destroyed the entire town of wooden buildings, leaving 10,000 inhabitants homeless. Shortly thereafter the entire town was rebuilt using stone, brick and mortar, much of which remains today. The architectural style of the day was Art Nouveau so all of the towns’ older buildings were rebuilt in this style. In addition to the oil industry, the city also is know for its manufacturing of Stressless furniture. The Stressless furniture is a luxury line of reclining chairs and sofas. Today the town has a population of about 50,000. 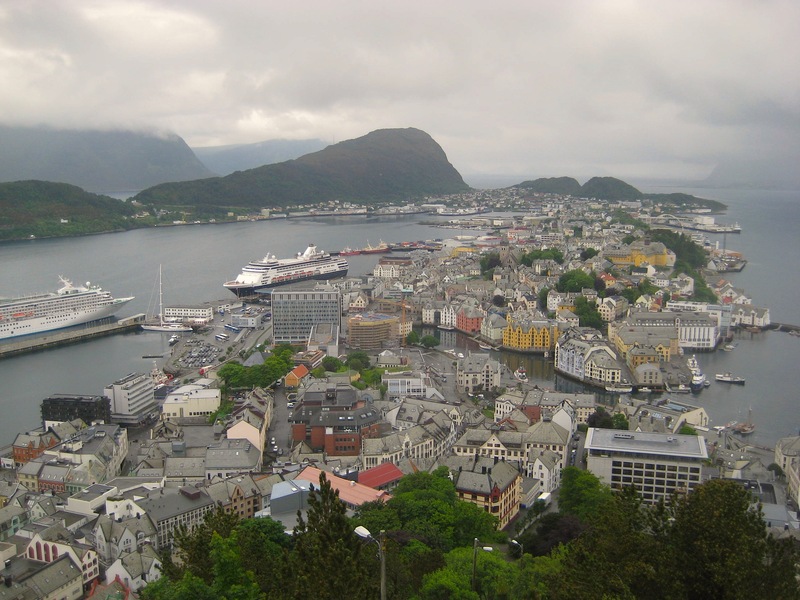 Our exploring took us through town to the Alesund Park where we began our climb up 418 steps to reach Mt. Aksla for a panoramic view out over Alesund and the surrounding islands. The climb up the hill was tiring but the views from the top are spectacular. Our friend Eddy joined us for the climb. After returning to town we wandered the streets exploring the wonderful Art Nouveau buildings with their floral motifs. The majority of these old buildings have been beautifully maintained and many meticulously painted to show off the Art Nouveau details. Some have large sunflowers cascading down the façade while others are simpler with only a decorative owl and leaf motif around the entrance. Others have very detailed garlands of flowers and fruits accenting the roofline or the ground floor retail space. Most of the buildings have stone and plaster exteriors with wrought iron railings and adornments. The streets themselves are mostly comprised of small granite paver stones. 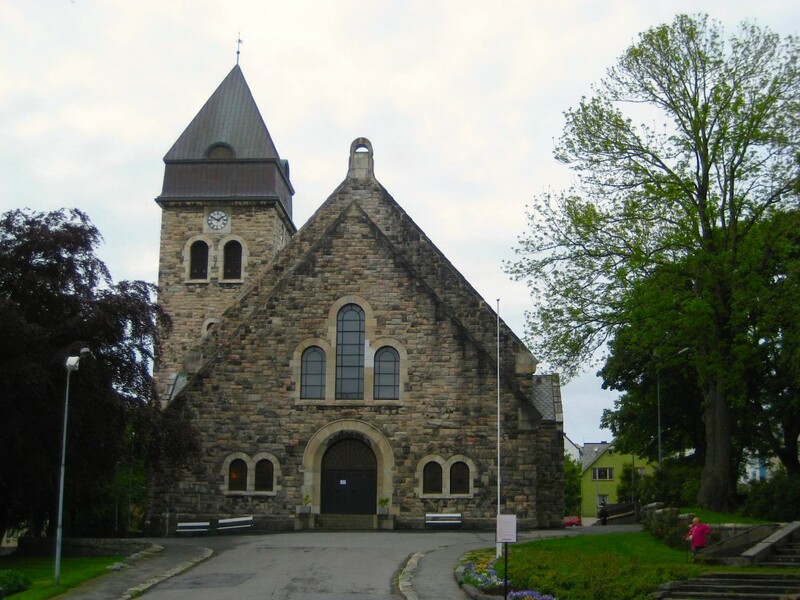 We walked to the Alesund Church to see its beautiful stone exterior and adjacent cemetery. The present church dates back to 1909 after the fire although the cemetery appeared to only date back about ten years. The exterior of the church is very nice; unfortunately we were unable to see inside the church. While out in town we ran into Chris Marcado, a shopkeeper from onboard the Amsterdam last year on the 2013 world cruise. He is now working on the Crystal Symphony which is a much more luxurious ship. He says that he has only been on it a short time but while the ship’s public areas are very beautiful he is having trouble adjusting to the smaller crew quarters, food and a different makeup of the crewmembers. He was on his way to see Ryndam crew he may know. The weather today was much colder than we have been experiencing with a high of only 47 degrees. We were lucky in that it was only mostly cloudy and the rain was limited to a very light sprinkle while we were ashore. The hours of daylight are continuing to get longer with the sunrise at 3:46 am and the sunset not until 11:30 pm. The night’s entertainment was a twenty-six year old British concert pianist by the name of David Schofield. We had him as an entertainer on the world cruise last year and he is a wonderful entertainer and pianist. David grew up in Manchester, England where he learned to play the piano at the age of four. His parents sent him to a private boarding school for nine years to continue his studies. His next stop was Chicago where he studied piano and when he was only nineteen-years-old he won a music competition at Carnegie Hall and since then he has been performing all over the world at concert halls and aboard cruise ships.